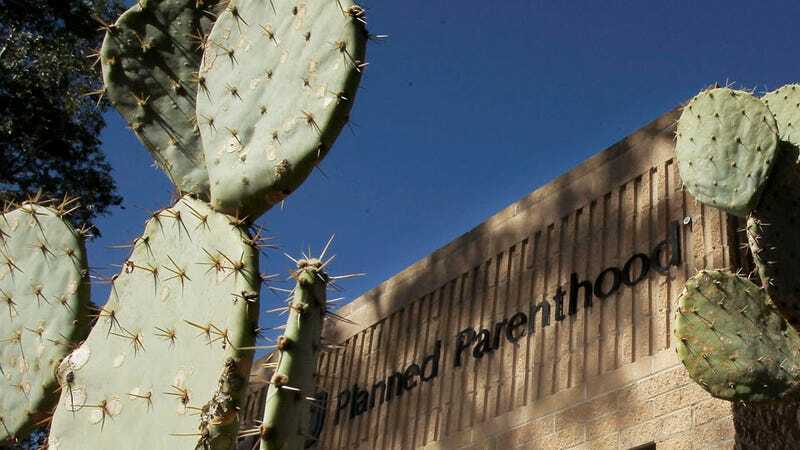 Good news from Arizona (shocking, we know): a federal judge overturned a law that tried to block state funding for Planned Parenthood clinics because a (/too) few of their clinics provide abortions in addition to other crucial health services. We shouldn't have to profusely thank a judge for making a just decision, but: THANK YOU SO MUCH. Anti-abortion advocates said that the law was necessary to make sure the state wasn't providing tax dollars for abortion (which is illegal under the Hyde Amendment, something backers love to fake-forget) via indirect funneling of funds. In other words, they were trying to cut countless low-income women off from the services they desperately need by pretending that Planned Parenthood operates somewhat like the Mafia. Also, not that it should matter, but only 3 percent of the state's Planned Parenthood clinics offer abortion services. Facts! Who needs 'em? Bryan Howard, president and chief executive of Planned Parenthood Arizona, told Reuters that the decision was "a victory for all Arizonans" and women who count on their services. This is also a huge victory on a national level, since Arizona is hardly the only state where lawmakers have tried to cut off funding for Planned Parenthood; the organization is currently fighting the hard fight in Texas. Hopefully more judges will follow Wake's example.